Muddy River Art Association - Muddy River Art Association -- Welcome to our new website! Muddy River Art Association is a non-profit arts organization founded by artists for artists. We welcome all skill levels, from amateurs to professionals. We hold monthly meetings with interesting speakers. During the year we gather for an annual picnic and a holiday party, coordinate rotating community exhibits, host juried art competitions, and promote the arts. We have over 75 members who come from many different counties including Alamance, Davie, Forsyth, Guildford, Stokes and Surry. Our members work in a variety of media: oils, watercolor, acrylic, mixed media, glass, fiber, and sculpture. The organization was created to encourage cooperation and artistic exchange among artists and others engaged in artistic activities, promote appreciation of the arts, hold art exhibition, competitions or performances, and promote the study and improvement of the arts in the western Forsyth County region of North Carolina. Interested in joining? Become a member here. ​Each spring, Muddy River Art Association is proud to host the Scholastic Art Show for students K-12 in the western Forsyth County area of North Carolina. 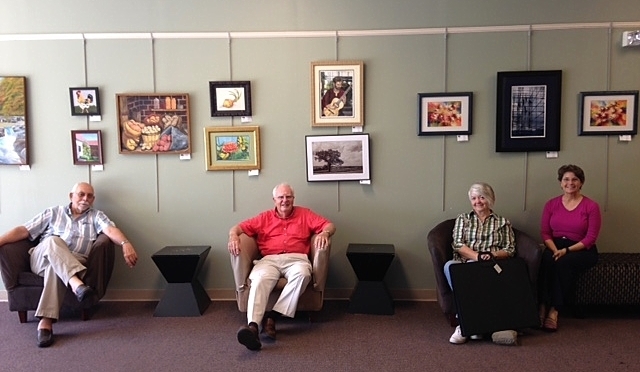 Students are invited to display their art in a juried two week long show at the Clemmons Public Library in Clemmons, NC to showcase local students' art. There is a public opening reception for the exhibit, which includes prize awards and refreshments.